Tuesday February 12th, a technical conference took place, which was organized by EPSAR, to talk about the emerging pollutants. 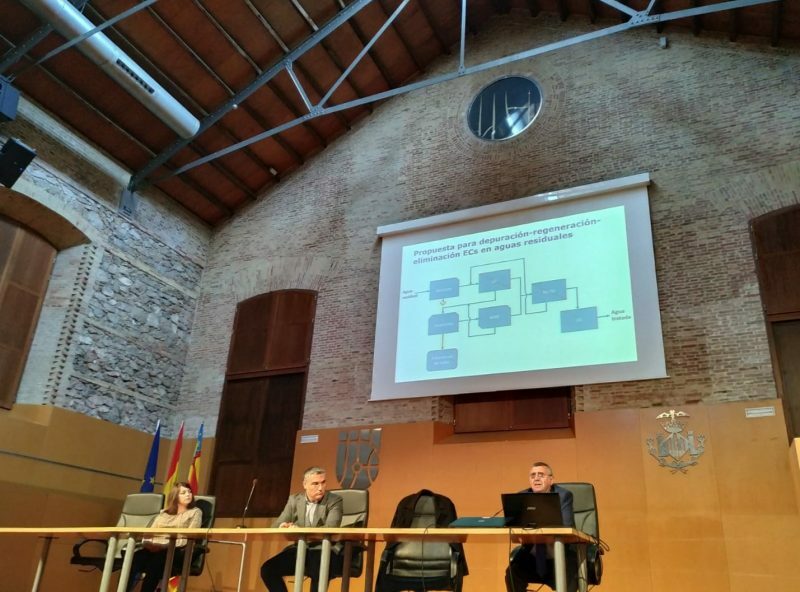 The conference; ‘Treatment and elimination of pollutants, emerging from effluents by urban treatment plants’ was held in Valencia and the LIFE EMPORE project participated in the event as well. The objective of the technical conference was to raise awareness about the existing problems concerning the presence of emerging pollutants in EDAR effluents at a European level. 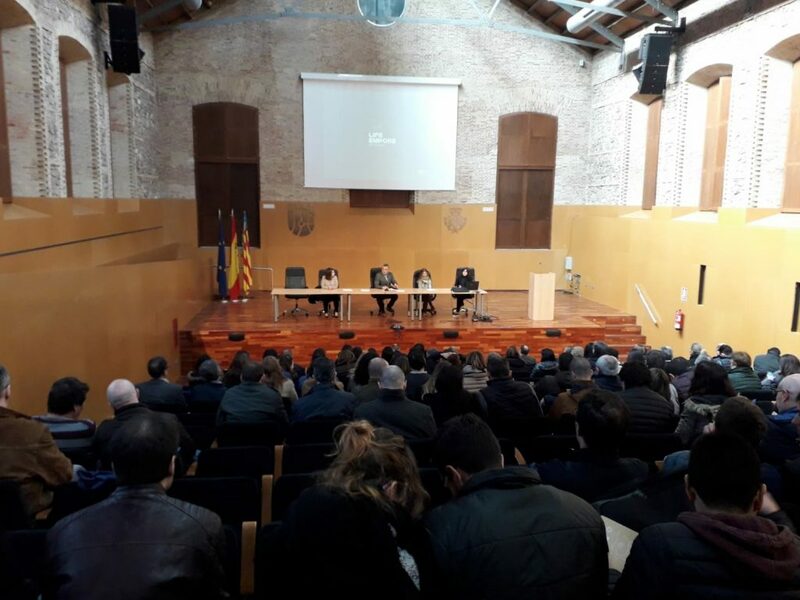 In order to bring across the important message of this problem, the LIFE EMPORE project was presented to the public, as well as LIFE AQUEMFREE and the LIFE CLEAN UP initiatives, which have been focusing on the Murcia region. The event was attended by representatives of LIFE projects, wastewater treatment companies, wastewater managers, consultants, equipment manufacturers, research organizations, universities, public administration representatives, etc. The day began with the presentation and discussion of the problem known as ‘the presence of emerging pollutants in the effluents from urban treatment plants’. During the introduction of the event, topics such as the sources of emerging pollutants, their wastage in Spain and the current regulation regarding CEs were discussed. The presence of emerging pollutants in other European regions and their effects were also evaluated. After having discussed the present problem, the projects that are being carried out with the aim of proposing possible viable solutions were explained. At this stage, the LIFE EMPORE project was presented and its objective, which is to develop an efficient and sustainable methodology focusing on the elimination of emerging pollutants from effluents by European WWTPs. Furthermore, the methodologies used in the demonstrator and its operation of water treatment on three different levels were described. The results obtained so far were also shared during the technical conference. During the event, the situation of emerging pollutants in the sewage system of the Murcia region was also discussed. LIFE AQUEMFREE and LIFE CLEAN UP, that are both part of LIFE projects, were invited to the conference. Their objectives and methodologies used in this area of Spain were further explained. The decontamination of agricultural wastewater by solar photocatalysis is the purpose of LIFE AQUEMFREE. The LIFE CLEAN UP project focuses on achieving the elimination of emerging pollutants from treated wastewater by passing through a polymer of cyclodextrins. EMPORE (ref LIFE15 ENV / ES / 000598) is co-financed by the LIFE European Program, financial support department of the European Union dedicated exclusively to the co-financing of projects in favor of the environment. The project will last for 36 months and has a total budget of € 1,783,824.